You probably saw the teaser a few months back on TV and in cinemas. And now, the official trailer is finally out! You may watch it on HD here. 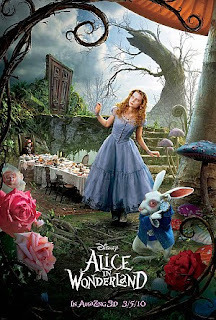 Perhaps one of the most awaited movie of the year, Tim Burton's adaptation of Alice in Wonderland will surely change the way you view Wonderland. The movie is an extension of the Lewis Carroll novels Alice in Wonderland and Through the Looking Glass. If you want to know all about Alice, you may want to visit the Christ Church University in Oxford, England where it all began. Alice has already grown and Wonderland needs her more than ever. Your beloved characters are still here: Mad Hatter, Chesire Cat, Alice, White Rabbit, White Queen, Red Queen. The movie is star-studded, with cast including Mia Wasikowska, Johnny Depp, Anne Hathaway, and Helena Bonham Carter. The film is distributed by Walt Disney Pictures and will premiere in London on February 25th, 2010 and will be shown the world over on March 5th, 2010. So don't miss this movie event of the year! If I missed Avatar, I surely wouldn't want to miss THIS! how much is ticket in pinay? this is up at cinema now!